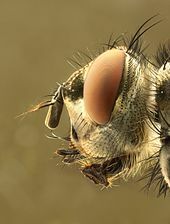 The Calliphoridae (commonly known as blow flies, blow-flies, carrion flies, bluebottles, greenbottles, or cluster flies) are a family of insects in the order Diptera, with 1,200 known species. 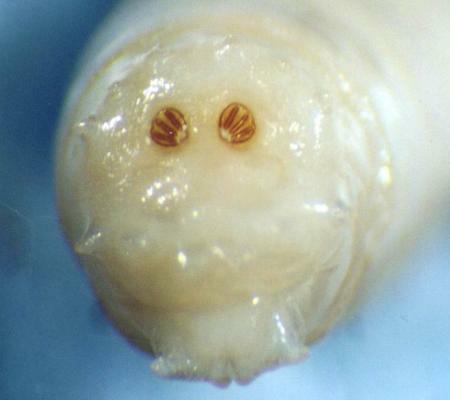 The maggot larvae, often used as fishing bait, are known as gentles. The family is known to be polyphyletic, but much remains disputed regarding proper treatment of the constituent taxa, some of which are occasionally accorded family status (e.g., Bengaliidae, Helicoboscidae, Polleniidae, and Rhiniidae). Predators of blow flies include: spiders, beetles, frogs, and birds including chickens. Blow flies have caught the interest of researchers in a variety of fields, although the large body of literature on calliphorids has been concentrated on solving the problem of myiasis in livestock. The sheep blow fly Lucilia cuprina causes the Australian sheep industry an estimated AU$170 million a year in losses. The most common causes of myiasis in humans and animals are the three dipteran families Oestridae, Calliphoridae, and Sarcophagidae. Myiasis in humans is clinically categorized in six ways: dermal and subdermal, facial cavity, wound or traumatic, gastrointestinal, vaginal, and generalized. If found in humans, the dipteran larvae are usually in their first instar. The only treatment necessary is just to remove the maggots, and the patient heals naturally. Whilst not strictly a myiasis species, the Congo floor maggot feeds on mammal blood, occasionally human. Maggot debridement therapy (MDT) is the medical use of selected, laboratory-raised fly larvae for cleaning nonhealing wounds. Medicinal maggots perform debridement by selectively eating only dead tissue. Lucilia sericata (Phaenicia sericata), or the common green bottlefly, is the preferred species used in maggot therapy. MDT can be used to treat pressure ulcers, diabetic foot wounds, venous stasis ulcers, and postsurgical wounds. 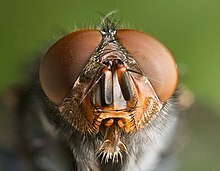 Blow flies are usually the first insects to come in contact with carrion because they have the ability to smell dead animal matter from up to 1 mile (1.6 km) away. Upon reaching the carrion, females deposit eggs on it. 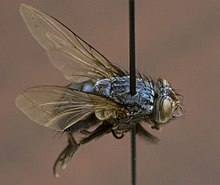 Since development is highly predictable if the ambient temperature is known, blow flies are considered a valuable tool in forensic science. 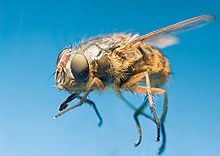 Blow flies are used forensically to estimate the PMImin (minimum post-mortem interval) for human corpses. Traditional estimations of time since death are generally unreliable after 72 hours and often entomologists are the only officials capable of generating an accurate approximate time interval. The specialized discipline related to this practice is known as forensic entomology. In addition to being used to estimate the minimum post-mortem interval (PMImin), assuming colonization occurred after death, blow fly specimens found infesting a human corpse are used to determine if the corpse was relocated or if the individual ingested narcotics prior to death. ^ UniProt. "Calliphoridae". Retrieved 31 May 2008. ^ a b "Calliphoridae". Integrated Taxonomic Information System. Retrieved 31 May 2008. ^ Whitworth, Terry (July 2006). "Keys to the Genera and Species of blow Flies (Diptera: Calliphoridae) of America North of Mexico" (PDF). Proceedings of the Entomological Society of Washington. 108 (3): 689–725. ^ "Gentle". Oxford Dictionaries. Retrieved 24 May 2016. ^ a b Brundage, Adrienne (13–15 February 2008). "Calliphoridae". Texas A&M University, College Station. ^ Anne Hastings, David Yeates & Joanna Hamilton (2004). "Anatomical Atlas of Flies". CSIRO. Retrieved 13 January 2012. ^ "Biological Sciences: Northern Kentucky University". Nku.edu. 14 January 2013. Retrieved 29 May 2014. ^ "INSECTES15-4". Aramel.free.fr. Retrieved 29 May 2014. ^ "diaporama image". Archived from the original on 27 December 2004. Retrieved 11 March 2014. ^ Goodman, Lesley J. (1964). "The landing responses of insects. II. The electrical response of the compound eye of the fly, Lucilia sericata, upon stimluation by moving objects and slow changes of light intensity" (PDF). Journal of Experimental Biology. 41 (2): 403–415. ^ Welch, John B. (1993). "Predation by Spiders on Ground-Released Screwworm Flies, Cochliomyia hominivorax (Diptera: Calliphoridae) in a Mountainous Area of Southern Mexico". Journal of Arachnology. 21 (1): 23–28. doi:10.2307/3705375 (inactive 25 October 2018). JSTOR 3705375. ^ Grunin, K. Ya. (1966). "New and little-known Calliphoridae (Diptera), mainly bloodsucking or subcutaneous parasites of birds". Ent. Obozr (in Russian). 45: 897–903. ^ Brauer, F.; Bergenstamm, J. E. von (1893). Die Zweiflugler des Kaiserlichen Museums zu Wien, VI. Vorarbeiten zu einer Monographie der Muscaria Schizometopa (exclusive Anthomyidae). Pars III. F. Tempsky, Wien. p. 152. ^ a b c Hall, D. G. (1948). The blowflies of North America. Thomas Say Publ. p. 4. ^ Hardy, G. H. (1940). "Notes on Australian Muscoidea". Proceedings of the Royal Society of Queensland. 51: 133–146. ^ a b c Brauer, F.; Bergenstamm, J. E. von (1891). "Die Zweiflugler des Kaiserlichen Museums zu Wien. V. Vorarbeiten zu einer Monographie der Muscaria Schizometopa (exclusive Anthomyidae)". F. Tempsky, Wien: 142. ^ Aldrich, J. M. (1923). "A new genus and species of fly reared from the hoof of the carabao". The Philippine Journal of Science. 22: 141–142. ^ "Revision of the frog fly genus Caiusa Surcouf, 1920 (Diptera, Calliphoridae), with a note on the identity of Plinthomyia emimelania Rondani, 1875" (PDF). zootaxa. Retrieved 26 May 2016. ^ a b c Macquart, P. J. M. (1851). "Dipteres exotiques nouveaux ou peu connus. Suite du 4e supplement publie dans les memoires de 1849". Mem. Soc. R. Sci. Agric. Lille. 1850: 134–294. ^ a b Townsend, C. H. T. (1915). "A new generic name for the screw-worm fly". Journal of the Washington Academy of Sciences. 5: 644–646. ^ a b Townsend, C. H. T. (1918). "New muscoid genera, species anProposal of new muscoid generad synonymy (Diptera)". Insecutor Inscit. Menstr. 6: 151–156. ^ a b Townsend, C. H. T. (1917). "Indian flies of the subfamily Rhiniinae". Rec. Indian Mus. 13: 185–202. doi:10.5962/bhl.part.5859. ^ Grimshaw, P. H. (1901). "Part I. Diptera". Fauna Hawaiiensis. 3 (1): 1–77. ^ a b Townsend, C. H. T. (1908). "The taxonomy of the muscoidean flies, including descriptions of new genera and species". Smithson. Misc. Collect. 51: 138 pp. Archived from the original on 16 February 2015. Retrieved 22 November 2014. ^ Townsend, C. H. T. (1931). "Notes on American oestromuscoid types". Rev. Ent. (Rio J.). 1: 65–104. ^ Malloch, J.R. (1926). "Exotic Muscaridae (Diptera).--XVIII". The Annals and Magazine of Natural History. 9 (17): 489–510. ^ Brauer, F. (1895). "Bemerkungen zu einigen neuen Gattungen der Muscarien und Deutung einiger Original-Exemplare". Sber. Akad. Wiss. Wien. 104 (Abt. I): 582–604. ^ a b Brauer, F.; Bergenstamm, J. E. von (1889). "Die Zweiflugler des Kaiserlichen Museums zu Wien. IV. Vorarbeiten zu einer Monographie der Muscaria Schizometopa (exclusive Anthomyidae).Pars I". Denkschriften der Kaiserlichen Akademie der Wissenschaften. 56 (1): 69–180. Retrieved 25 November 2014. ^ Walker, F. (1859). "Catalogue of the dipterous insects collected at Makessar in Celebes, by Mr. A. R. Wallace, with descriptions of new species". Journal of the Proceedings of the Linnean Society of London. Zoology. 4 (14): 90–96. doi:10.1111/j.1096-3642.1859.tb00089.x. ^ Williston, S. W. (1893). "List of Diptera of the Death Valley Expedition". N. Am. Fauna. 7: 235–268. ^ Giglio-Tos, E. (1893). "Diagnosi di nuovi generi e di nuove specie di Ditteri. VIII". Boll. Mus. Zool. Anat. Comp. R. Univ. Torino. 8 (147): 11pp. ^ Villeneuve, J. (1933). "Myodaires superieurs asiatiques nouveaux". Bull. Ann. Soc. R. Ent. Belg. 73: 195–199. ^ Villeneuve, J. (1911). "Dipterologische Sammelreise nack Korsika. (Dipt.) [Schluss] Tachinidae". Deutsche Entomologische Zeitschrift. 1911: 117–130. ^ Shannon, R. C. (1926). "Synopsis of the American Calliphoridae (Diptera)". Proceedings of the Entomological Society of Washington. 28: 11. ^ Villeneuve, J. (1920). "A propos de la revision de Muscidae testaceae de J. Surcouf". Bulletin de la Société Entomologique de France. 1920: 223–225. ^ Crosskey, R. W. (1965). "A systematic revision of the Ameniinae (Diptera: Calliphoridae)". Bulletin of the British Museum (Natural History), Entomology. 16: 33–140. doi:10.5962/bhl.part.21863. ^ Silvestri, F. (1920). "Contribuzione alla conoscenza dei termitidi e termitofilidell' Africa occidentale. II. - Termitofili. Parte seconda". Boll.Lab. Portici. 14: 265–319. ^ Hough, G. de N. (1899). "Some North American genera of the dipterous group, Calliphorinae Girschner". Entomological News. 10: 62–66. ^ Bezzi, Mario (1927). "Some Calliphoridae (Diptera) from the South Pacific islands and Australia". Bulletin of Entomological Research. 17 (3): 231–247. doi:10.1017/s0007485300019283. ^ Séguy, Eugène (1926). "Sur une forme nouvelle se rapportant aux "Oestridae dubiosae"". Encyclopedia Ent. (B II). 3: 1–10. ^ Bigot, J. M. F. (1857). "Dipteres nouveaux provenant du Chili". Annales de la Société Entomologique de France. 3 (5): 277–308. ^ Macquart, P. J. M. (1843). "Dipteres exotiques nouveaux ou peu connus". Mem. Soc. R. Sci. Agric. Lille. 2 (3): 162–460. ^ Loew, H. (1863). "Enumeratio Dipterorum quae C. Tollin ex Africa meridionali (Orangestaat, Bloemfontein)". Wien. Ent. Monatschr. 7: 9–16. ^ Malloch, J.R. (1935). "The Diptera of the Territory of New Guinea. III. Families Musicidae and Tachinidae". Proceedings of the Linnean Society of New South Wales. 60: 74–78. ^ Róndani, C. (1861). Dipterologiae Italicae prodromus. Vol. IV. Species Italicae ... Pars tertia. Muscidae Tachininarum complementum. IV. A. Stocche, Parmae. pp. 174 pp. ^ Rohdendorf, B. B. (1931). "Calliphorinen-Studien IV (Dipt.). Eine neue Calliphorinen-Gattung aus Ostsibirien". Zoologischer Anzeiger. 95: 175–177. ^ Townsend, C. H. T. (1933). "New genera and species of Old World oestromuscoid flies". Journal of the New York Entomological Society. 40: 439–479. ^ Wulp, F. M. van der (1885). "Quelques dipteres exotiques". 28. Bulletin & Annales de la Société Entomologique de Belgique: cclxxxviii–ccxcvii. ^ Villeneuve, J. (1927). "Myodaires superieurs nouveaux de l'Œle de Formose". Revue Zool. Bot. Afr. 15: 387–397. ^ Tuomikoski, R. (1960). "The Ocydromiinae group of subfamilies (Diptera, Empididae)". Ann. Entomol. Fenn. 32: 282–294. ^ Austen, E. E. (1914). "On Diptera collected in the western Sahara by Dr. Ernst Hartert, with descriptions of new species. Part II". Novitates Zoologicae. 21: 265–274. doi:10.5962/bhl.part.16330. Retrieved 27 November 2014. ^ Malloch, J.R. (1924). "The recorded Calliphoridae of New Zealand (Diptera)". Proceedings of the Linnean Society of New South Wales. 55: 638–640. ^ Sabrosky, Curtis W. (1999). "Family-Group Names in Diptera An annotated catalog" (PDF). MYIA, the International Journal of the North American Dipterists' Society. 10. Archived from the original (PDF) on 11 April 2008. ^ Rognes, Knut; Pape, Thomas (19 April 2007). "Taxon details: Calliphoridae". Fauna Europaea version 1.1. Retrieved 31 May 2008. ^ "Diptera: B–C". Nomina – a classification of the Insects of North America as portrayed in Nomina Insecta Nearctica. 1998. Archived from the original on 6 May 2006. Retrieved 31 May 2008. ^ Kurahshi, Hiromu (28 May 2007). "109. Family CALLIPHORIDAE". Australasian/Oceanian Diptera Catalog. Retrieved 31 May 2008. ^ Yazdi, Ismail. "Oral mucosa myiasis caused by Oestrus Ovis". Archives of Iranian Medicine. Retrieved 17 April 2008. ^ Sutherst, R. W.; Spradbery, J. P.; Maywald, G. F. (1989). "The potential geographical distribution of the Old World screwworm fly, Chrysomya bezziana". Med. Vet. Entomol. 3 (3): 273–280. doi:10.1111/j.1365-2915.1989.tb00228.x. ^ Byrd, Jason H. "Secondary Screwworms". Featured Creatures Jan 1998 1–2. Archived from the original on 10 March 2008. Retrieved 28 March 2008. ^ Monaghan, Peter (1 June 2007). "Rx:Maggots, Notes from Academe". The Chronicle of Higher Education. 53 (39): A48. ^ Sherman, R. (September 2006). "Maggot Therapy Project". Maggot Therapy. Retrieved 28 March 2008. ^ "NOAH Compendium of Animal Medicines: Crovect 1.25% w/v Pour-on Solution for Sheep - Dosage and administration". Archived from the original on 19 October 2013. Retrieved 11 March 2014. ^ Peacock, Andrew (31 August 2004). "Blow fly in Sheep" (PDF). Newfoundland and Labrador Agriculture. Archived from the original (PDF) on 17 December 2008. Retrieved 15 April 2008. ^ Olsen, Alan R. (1998). "Regulatory Action Criteria for Filth and Other Extraneous Materials*1 III. Review of Flies and Foodborne Enteric Disease". Regulatory Toxicology and Pharmacology (Submitted manuscript). 28 (3): 199–211. doi:10.1006/rtph.1998.1271. PMID 10049791. ^ Joel Greenberg (2004). "Many more than we know: insects". A Natural History of the Chicago Region. University of Chicago Press. pp. 291–316. ISBN 978-0-226-30649-0. ^ Klong-klaew, Tunwadee; Ngoen-klan, Ratchadawan; Moophayak, Kittikhun; Sukontason, Kom; Irvine, Kim; Tomberlin, Jeffery; Kurahashi, Hiromu; Chareonviriyaphap, Theeraphap; Somboon, Pradya (December 2018). "Spatial Distribution of Forensically Significant Blow Flies in Subfamily Luciliinae (Diptera: Calliphoridae), Chiang Mai Province, Northern Thailand: Observations and Modeling Using GIS". Insects. 9 (4): 181. doi:10.3390/insects9040181. ^ Stephen W. Bullington (24 July 2001). "Blow flies: their life cycle and where to look for the various stages". Forensic Entomology. Archived from the original on 13 October 2006. Retrieved 13 January 2012.